Toilet Repair Vallejo, CA | A+ Waterworks, Inc. If you are repeatedly having issues in your bathroom that even your trusty plunger can’t solve, it is time for professional toilet repair. Vallejo, CA residents trust A+ Waterworks for fixing the issues in their toilet bowls. For more than 20 years, A+ Waterworks, a locally owned sanitation service provider, has been trusted for sanitation and plumbing services such as toilet repair in Vallejo, CA. We understand that toilet repair in Vallejo, California is an urgent concern. This is why A+ Waterworks is on call 24 hours a day, 7 days a week for toilet repair in Vallejo, CA and other North Bay cities. Our technicians for toilet repair in Vallejo, CA are adept at uncovering the cause of the problem. From there, they will provide you with all the necessary information and effectively execute toilet repair in Vallejo, California. When Do You Know That It Is Time for Professional Toilet Repair? Vallejo, CA Residents, Take Note! Toilet repair in Vallejo, CA is necessary when you see toilet leaks. When your toilet leaks from the water tanks, you need to call the experts for toilet repair in Vallejo, CA straightaway because it is something that can’t be repaired with the basic tools we keep at home. One common indication that the tank is leaking externally is when water in your toilet starts to run randomly. Call for toilet repair in Vallejo, CA immediately to address the problem. Often, the flapper or the toilet tank gasket needs to be repaired or replaced, and the technicians of A+ Waterworks have the right skills and equipment for toilet repair in Vallejo, California. Calling us for toilet repair in Vallejo, CA immediately will save you from further damage and expense. Toilet repair in Vallejo, CA should be considered when you hear unusual noises in your drain. Whistling noises during the flush-refill cycle normally indicate a problem with the fill valve. Once you start hearing such odd noises, call A+ Waterworks immediately for toilet repair services in Vallejo, CA. Toilet repair in Vallejo, CA is a must when your toilet does not flush because it is clogged or does not flush completely. Broken or disconnected chains that connect the flush handle lever to the flapper prevent water from running through your flush. Hire us to perform toilet repair in Vallejo, CA before your flush stops working altogether, causing a stinky problem. Toilet repair in Vallejo, California is necessary if your flush never stops due to a drain issue. If you hear a faint drip of water coming from the ballcock, it is a sign that the flapper is unable to drop low enough to seal the hole. If you have already adjusted the chain yet it does not solve the water problem, it is time to call A+ Waterworks for professional toilet repair in Vallejo, CA. Call for toilet repair in Vallejo, CA when your toilet bowl gets clogged consistently. If you find your bathroom toilet bowl regularly requiring plunging, it may be a sign that you need professional toilet repair in Vallejo, CA. Your toilet bowl getting clogged on a regular basis may be an indication that there is an obstruction further down the drainpipe. Professionals in toilet repair in Vallejo, CA will also discover if there is an even bigger problem beneath the sewer line. Toilet repair in Vallejo, CA is a must if you see water near the toilet base. For your needs in plumbing, sanitation, and toilet repair in Vallejo, CA, turn to a company with a proven track record of efficient service. Call A+ Waterworks at 707-255-6150. 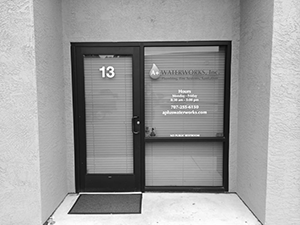 When it comes to emergency professional plumbing, fire system installation, and sanitation services for residential and commercial clients, turn to A+ Waterworks. We have been serving the North Bay area of California since 1994 and have been hailed as one of the best in the industry. Our emergency bathroom services are available to clients 24 hours a day, seven days a week. Whether it’s a small leak in your sink at 2 in the morning, or a total overhaul of your plumbing system at a scheduled time, A+ Waterworks is ready to give you A+ service!